With colostrum growing in popularity, we have a responsibility to educate and inform the public about the important facts to consider about this remarkable substance. Especially, how colostrum works, how best to choose a brand of colostrum, and how best to use it for optimum health. Colostrum supports the human organism in two main ways. First, its multiple immune factors and natural antibiotics provide strong support for the immune system. Second, its many growth factors offer a broad-spectrum boost to the organism to encourage optimum health and healing. What are the Benefits of Colostrum Supplementation? Colostrum is incredibly effective at shutting down the cause of most disease and infection; when this occurs, the body can then work to repair and rebuild the damaged tissues and allow adults, children, and animals to enjoy radiant and robust health. Bovine colostrum contains over 200 components that have been identified to date. These include immunoglobulins (antibodies), proline-rich polypeptides (PRPs), lactoferrin, glycoproteins (protease and trypsin inhibitors), lactalbumins, cytokines (interleukins, interferon, lymphokines), lysozyme, growth factors, vitamins and minerals. Colostrum is highly beneficial in the unique manner in which it provides the body with its numerous immune and growth factors. Most infectious disease-causing organisms enter the body through the mucous membranes of the intestinal tract. In order to remain healthy, it is critical that we are able to combat disease-causing organisms, such as bacteria and viruses, as well as environmental toxins, contaminants and allergens where they attack us. Bovine colostrum is safe, non-toxic and can be consumed in any quantity without side-effects or drug interactions. Colostrum contains special enzymes that prevent its immune and growth factors from being digested. The most crucial step in processing colostrum for human consumption is pasteurization. The following section helps to explain exactly why this is so important in providing consumers with a product that is guaranteed to be safe and effective. In a comparison of the antibody activity in colostrum with that of hyperimmunized milk, the normal (not artificially created) antibody activity in colostrum is much more prominent. This demonstrates that dairy cows produce antibodies to all naturally occuring pathogens in their environment, from the grasses they eat and the human pathogens they come in contact with. 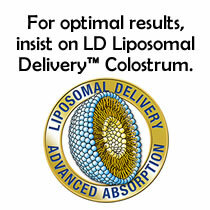 The quality and thus, effectiveness of colostrum depends on three factors – the colostrum source, the testing and verification of active components, and the LD Liposomal Delivery mechanism. Sovereign Health Initiative and CNR have identified key areas for evaluating colostrum products.